← Does My Bathroom Offend You? I am not sure if I have mentioned it before on my blog, but I have been trying out my hand at couponing. I have only been doing it for about 3 weeks so I am still just trying to get my coupon book up and going to where I have a stock of coupons to work together with store deals! Quite honestly, this week I have gotten a little sick of couponing because I am just flat out tired of clipping coupons and it hasn’t been saving us a whole lot of cash… until today! Yesterday we went grocery shopping and I was a little disappointed that we only saved about $5, which I suppose that $5 is $5 and I am happy to have saved it but it just wasn’t what I wanted. We were buying some miscellaneous items so we didn’t have a whole lot of coupons that fit our deals, plus we went to WalMart and they don’t double coupons like Homeland does. While I was clipping my coupons from today’s paper, I noticed that I had some Extra Care Bucks (ECBs) from previous visits to CVS that were going to expire on Tuesday. I have been needing some body wash and shampoo/conditioner so I decided I would check out the circular to see if I could get my coupons to match some deals for me! I had $11.99 in ECBs that I could just spend like cash. CVS is probably my absolute favorite place to coupon! It takes a little work to understand how to work the deals, but I watched this tutorial and it made complete sense and even made me excited to get started. I just wanted to share the deal that we worked at CVS tonight cause I am so excited about it. We made $0.52 for $37.76… for a savings of $38.28!!! 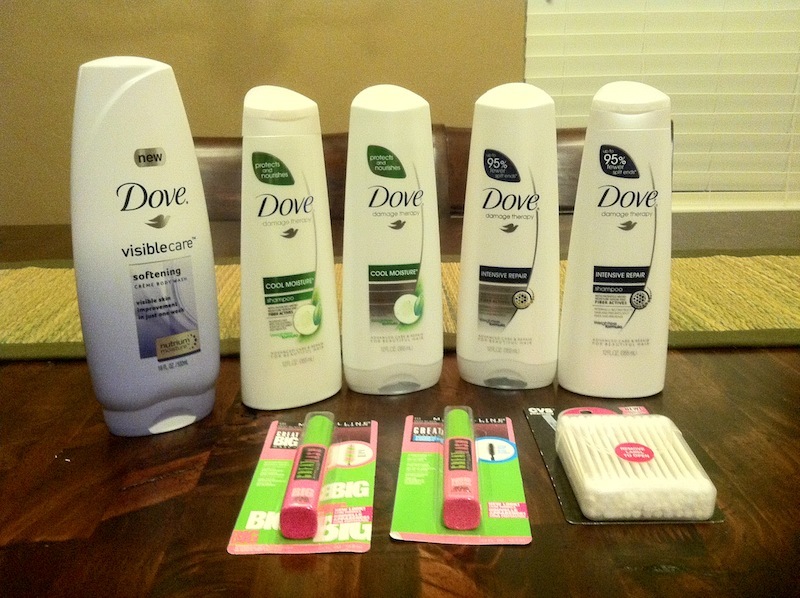 I worked on the deal for the Dove products at home before we headed to the store. In the store you can scan your CVS card at the coupon kiosk and receive a coupon in store. I received an in-store coupon for $3 off the purchase of $10 of cosmetic last week that was to expire today. I also scanned my card again today and received $1 off any Maybelline cosmetic purchase. Lucky for me, I had 2 coupons in my folder and they were both $1 off Maybelline mascara. This specific mascara just happened to also be buy 1 get one 1/2 off. I cannot quite remember the exact numbers on these coupons for mascara but the original price for the mascara was around $4.99. I did the buy 1 get one 1/2 off (2 tubes for $7.49), $1 off each tube (bringing the total down to $5.49), as well as the $1 off coupon that I printed at the kiosk making the total price for both of the mascaras $4.49 (would have originally been $9.98.) I wasn’t going to use the coupon for the $3 off a $10 cosmetic purchase because I didn’t think I was going to meet the $10 but my husband noticed that I was 2 pennies away from the $10. The cheapest thing I could find was a travel pack of Q-tips for $0.99, which ended up being on sale and ringing up for only $0.49 (I had to spend $.49 but it ended up saving us $2.51 off our cosmetic purchase.) The price of the 2 mascaras and the q-tips would have been $10.97 and we only ended up spending $4.98! A few weeks ago, I also received a coupon via email that was $3 off a $15 purchase which we were able to use. Some of my numbers won’t add up exactly because I might not be remembering exactly how the coupons work or the exact price of the original product and the receipt isn’t easy to follow. As I said before, we had $11.99 in ECBs (CVS cash earned from previous purchases) that we were able to put toward this purchase. Our out-of-pocket subtotal was only $4.48! Also, remember the deal that CVS had for purchasing $15 of select Dove products, we got $5 in ECBs to use towards a future purchase. We essentially made 52 pennies!!! Obviously we had to pay tax which was $1.77! I definitely do not claim to be a good couponer, and I am most definitely NOT a crazy couponer nor do I (or will I ever) have hoards of products stored in my home but I WILL take advantage of an awesome deal if I can find one! This purchase tonight was well worth the time I put into developing my coupon book every week! 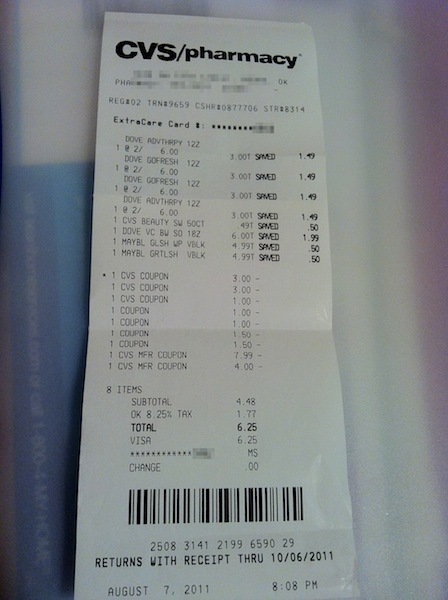 The tutorial I mentioned above from Carrie at CouponCloset.net is an awesome way to get started couponing at CVS! There is also a weekly list of good deals and you can even sign up for emails and get alerted to new printable coupons and she shows some awesome deals you can work!